Are you making a new year’s resolution to improve your eating habits? Why not consider adding loose leaf tea or tisane (herbal) beverages to your daily diet? Loose-leaf tea & tisane popularity is growing, in part because it tastes great and in part because it is healthier! Some people want to start but think it is too complicated to infuse loose leaf tea. I hope this little talk resolves the confusion and reveals that it is easy & fun to infuse. And perhaps you too will choose to infuse. Will the type of tea you enjoy fully expand in the infuser? Will the tea or tisane leak out of the infuser? Is it easy to use, clean, and store? Will you want the infuser to be mobile? Cost of the infuser, can range from $3-$20, tea pots & cups with infusers begin in the mid $20’s. Would you consider eco friendly DIY bags (filters)? What type of volume do you expect to prepare on a regular basis? A priority in selecting an infuser is be sure the tea or tisane can fully expand in the infuser; one of the main reasons loose leaf is chosen is the superior flavor & added nutrients that are extracted from the whole leaf. Another significant consideration is will the fine mesh contain all the tea & herbs? As always stay within your budget. Life-style factors include: are you highly mobile, will you carry it in a backpack or in the car, do you want some thing just easy in the morning, or do you prefer something for your desk, classroom or office, do you often prepare for more then 1 person at a time? I usually ask people interested in purchasing their first infuser to picture the primary location they want to have their tea. I am confident over time that picture will expand but begin with a narrow focus. Will the infuser allow your leaves to expand, is one of the most important questions to address! Tea balls are good for BOP, (broken orange pekoe) or a ctc (crush torn and curled) but an oolong, many of the green, white and full leaf blacks cannot fully expand in a tea ball. Yet, the price point is excellent and they are high mobile. So if choosing a tea ball be sure the tea itself will match well. Tea balls often do not have a fine mesh and sometimes the herbs or rooibos will slip into the beverage or broth. In that case the leaves etc are edible, :). But if you really do not want any of the product in the broth then strain after preparing of choose a different type of infuser. Infusers that fit into a variety of cups or teapots often work very well as an initial tool. These type of infusers have a top keeping the temperature warmer which doubles as drip pan once the steeping is completed. The price point is usually reasonable and they are mobile. Often people find them easier to clean then a tea ball and the mesh is usually fine enough to keep the tea & herbs in the infuser. If preparing for 2 plus cups be sure to have an infuser that is 3 inches for the added quantity. Tea Makers that infuse 16 oz or more are often desirable for household with multiple tea drinkers or people on the go. 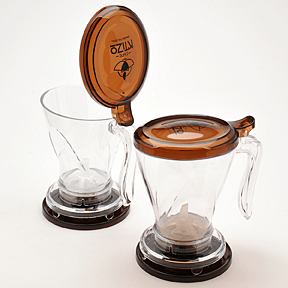 One type of tea maker dispenses from the bottom. 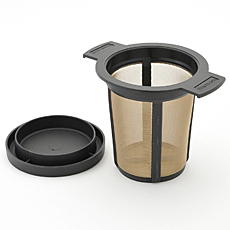 With this type of vessel, after the infusion is complete, place the tea maker over the cup of choice and the tea will dispense directly into the cup. This type is easy to clean, has fine mesh holding in the herbs, rooibos, botanical and tea leaves plus it is easy to make iced tea as well. If desiring iced tea, double concentrate, steep then place over a glass with ice in it. The price is mid-range. It is fantastic for the breakfast rush, afternoon cuppa or the evening relaxing tea time, but not considered mobile. Another tea maker would be the tea press. Here you can usually make 1-4 cups at a time, depending on the size purchased. It is easy to clean, and mid-range price point. Be sure to get a press that does not crush leaves, you never want to squeeze your leaves at the end of an infusion for a bitter flavor may result. Also be sure the press filter fits snuggly around the base so the leaves do not travel into the tea ‘broth’. This is typically used for a set location, not considered a mobile infuser. very well! If using tea blends that have fine particles be sure the infuser has fine mesh. Often the infuser can be used in more than just the original vessel. So even though the price point may be a bit higher, the product is more versatile. An added bonus is when the infuser is included with the cup or teapot there is a lid that functions to keep the temperature hot while steeping, then the lid doubles as a drip pan once the infuser is removed. Using a teapot is one of my favorite ways to prepare tea for it typically means I am sharing the event with others. Plus tea-pots are absolutely adorable! For those who are on the go traveling tea mugs or metro mugs are fantastic. An infuser will be included and can be cleaned off and returned to the mug so you will have an infuser available to you once you arrive at you destination. Metro-mugs are versatile, practical and mid-price range. I have highlighted a few great starter infusers that work well for highly active life-styles. There are many more infusing tools that accompany tea plus enhance the romance of the tea event. Cermonial tea events include a variety of vessels that add culture, art, ceremony and personality to the art of tea making which I hope to continue to write about in later blogs. Plus there are more infusers that are just plain old fun and functional. Lastly, the question of DIY tea bags. Tea filters (bags) are available in bio-degradable compostable unbleached bags that allow for fuller expansion and better extraction. These type of bags add about 6 cents to each use. They are highly mobile, easy to clean-up & great for leaf expansion. I really appreciate them when traveling. They are easy to bring on a plane or to a hotel. Many people choose to use them as their preferred method of infusing. The down side is you do need a saucer avaible when withdrawing them from the cup but they can easily be used for a re-steep. If looking for a great starter, have a limited budget and want something that is easy to transport, I highly recommend an infuser basket that can double in both cup a cup or pot and has plenty of room for the leaf to expand, such as the large floating infuser. If wanting something simple and easy for the home or office a tea-maker that dispenses from the bottom seems to be a great place for tea enthuisasts to begin. If wanting a great commuter tea mug, my new favorite is the metro-mug which keeps the tea hot for hours, (if it takes that long). If giving as a gift the tea-cup or tea-pot is always a special treat! If giving loose leaf to a friend who does not own an infuser, then a starter pack of diy tea filters (bags) is very convenient. I hope you choose to infuse in 2014! Have a Happy & Blessed New Year!